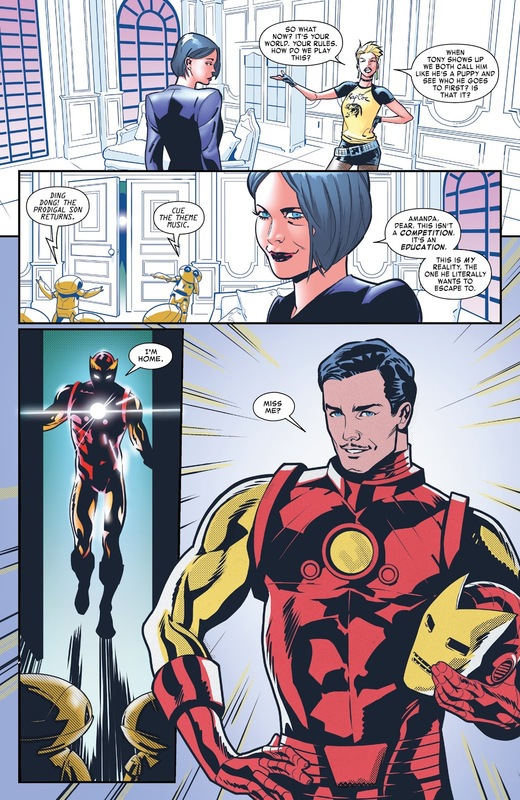 So we've gone from Tony was secretly adopted to Maria and Howard becoming Skynet. That cover is very cool though. I don't think that's his real mom, just a computer program based on her. Is that really even a distinction in the MU? Doc Ock's memories were taken from a digital backup long before any of the Superior Spider-Man stuff. Heck, Tony's memories ever since Dark Reign are from a backup he apparently secretly created sometime in the Warren Ellis run. 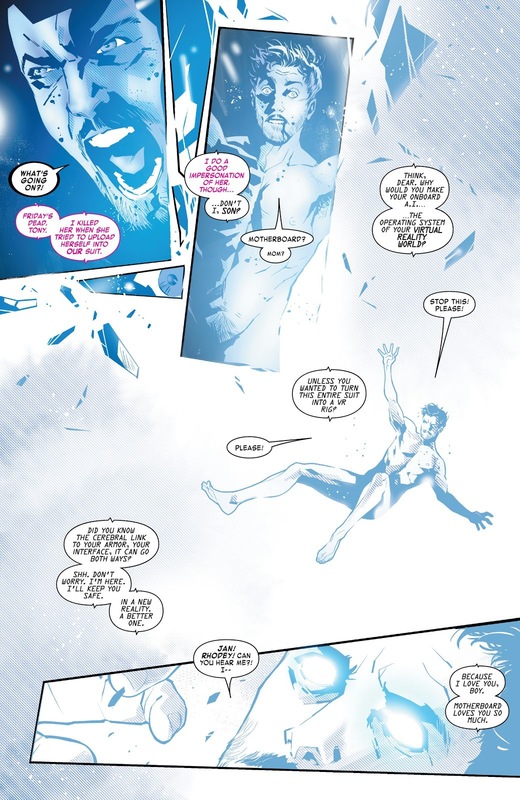 No one seemed to think Holo-Tony was any different than the fleshy version. I think there's a distinction between an AI's mind being copied from a person's and their mind being based on a person's. One's going to be identical or near the identical, the other's just someone's elaborate painting or sculpture of the reality. I haven't read this story, but I assume Howard and Maria Stark here are the latter since they seem to have been created years after the genuine articles passed away, and I can't imagine copies of their minds would just have happened to be lying around the Stark archives. I had already forgotten Holo-Tony was a thing but, yes, also that. Didn't the X-Books do something similar with Shard Bishop? I'm not sure I've ever read a comic with the "real" Shard. LOL at Skynet parenting him. Man, that is so Tony if this isn't just a bad dream. All this needs is a backup of the Living Armor. Wasn't the Living Armor really Ultron? No, the Living Armor was that's own being. The body was eventually dug up and possessed by Dimitrios, an offshoot of the virus Hank Pym used to kill Ultron iin Age of Ultron. I'd rather have Tony 2.0. 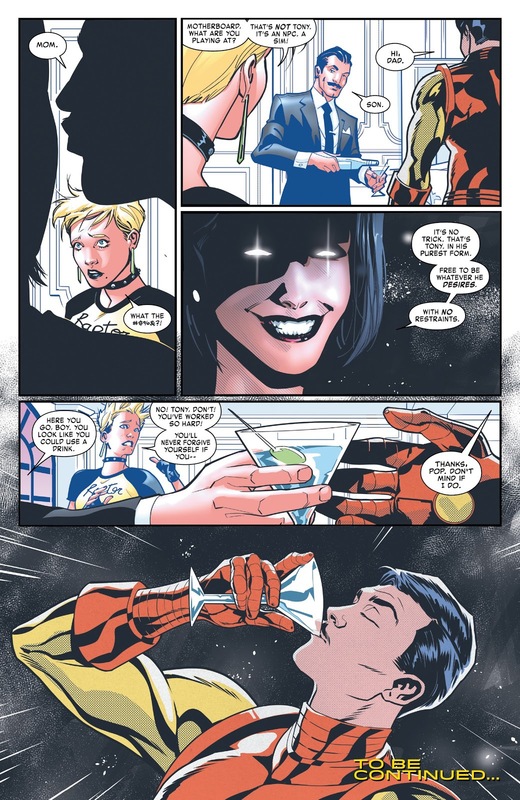 With the solicitation given for this issue, I was hoping for Tony to go for the alcohol without influence, reasoning that since it's virtual he's not REALLY drinking alcohol. Why is Amanda even concerned? Does the digital alcohol even somehow get the user drunk? Your mind makes the experience real? I don't think it can be good to give in to an addiction like that even if there's no real alcohol hitting his brain chemistry. Argh, Tony and his VR reality could be entertaining or go south sooo quickly. Here's something I posted back in 2016. 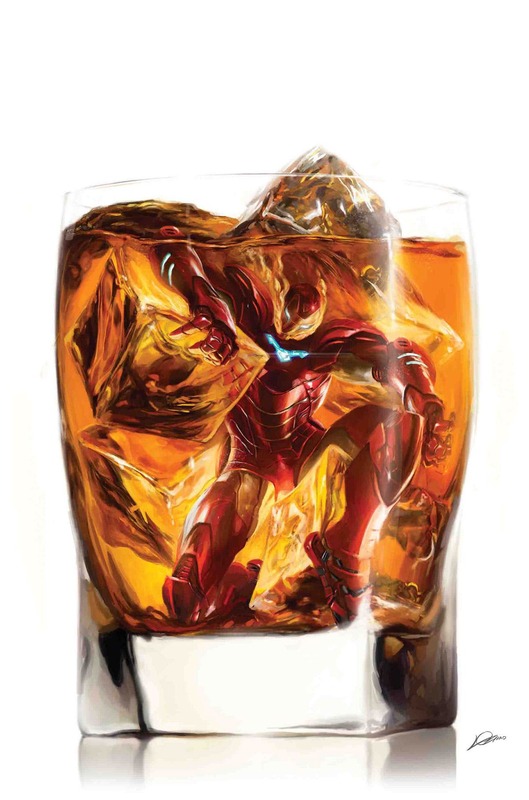 Tony Stark's alcoholism is just something that's "there" in the Marvel Universe. We don't really know why he's an alcoholic, or if there is a reason. Is it as simple as "Tony got addicted to alcohol because alcohol is addictive"? They don't really say. At last his second major slide into alcoholism from IRON MAN #165-182 was on-panel declared to be a long suicide attempt. And then some weird "I'll get addicted to the armor if I become Iron Man again" stuff until IRON MAN #200. When he first became an alcoholic, it was supposed to be because of SHIELD trying to absorb Stark Industries and Justin Hammer's efforts to destroy Iron Man's reputation, even hacking into his armor so that it would kill a foreign ambassador on live television while Tony was still in it. I'm not sure I understand what you mean, here. Are you asking 'why did Tony suddenly become an alcoholic when he hadn't been shown to be one before the Demon in a Bottle storyline' or just how someone becomes an alcoholic, period? I'm assuming the former. I mean, the Silver Age wasn't allowed to show things like that in its heroes, so introducing that aspect was a thing that couldn't have been done even a few years prior, really. As for it's continued reference, it's been out there repeatedly, afaik. I mean I remember references to Tony and another member going to AA during The Order. 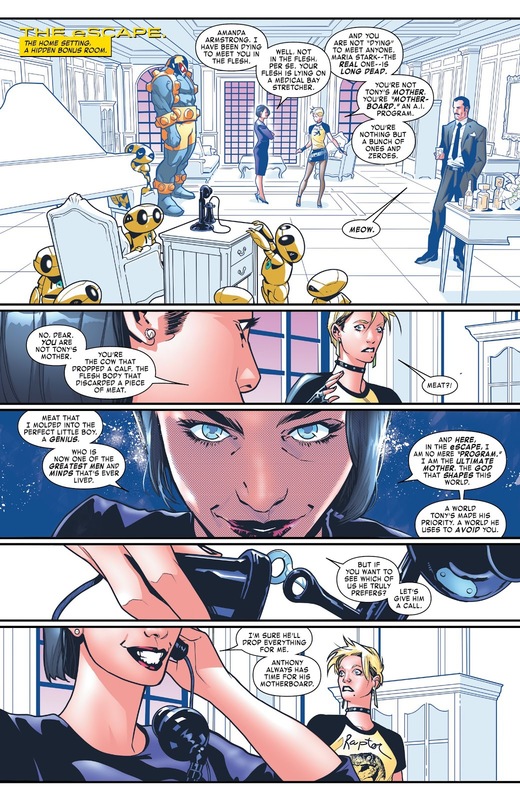 References to it when Tony was calling out Carol in the Avengers over her bout with it (and regular references to AA between both of them over the years). I can certainly see them being inconsistent about it over the years, but that's owed to the writers and to the changing understanding and attitudes on alcoholism in general. I can certainly see them being inconsistent about it over the years, but that's owed to the writers and to the changing understanding and attitudes on alcoholism in general. Flashbacks usually have "Tony drank a lot, but it never became a problem until 'Demon in a Bottle.'" I was wondering if there was ever really an explanation for it, even as simple as "alcohol is addictive." I think in reality the question is not so much “when did X become addicted to alcohol?” as “when did X realize/accept they were addicted, and start using that language and trying to address it?” Which can be a process; it doesn’t just happen on a single day. It’s nearly impossible to establish exactly when anyone’s substance use crosses over the line to substance abuse and addiction. Echoing that cover...who did the art for it?